Randalstown Young Farmers’ Club members have sprung to success this spring with impressive results at both county and national level. Well done to club member Georgia Nicholl who was awarded first place in the YFCU picture competition with the theme ‘Reduce, Reuse Recycle’. At Co Antrim YFC AGM Randalstown was awarded the most efficient club in Co Antrim. 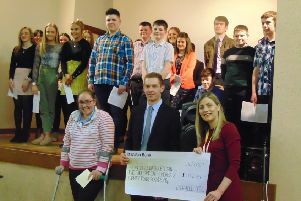 Congratulations are also extended to Elizabeth Adair who was placed first in the top PRO competition, Gemma Dickey who was placed third in the top secretary competition, Jack Johnston who was placed third in the top treasurer competition and Robert Smyth for his third place in the senior member of the year competition. Well done to everyone. March ended with the club holding their annual church service and raising £590 for Laurel House Chemotherapy Unit. April began with Christy Hill, Aaron McNeilly, Leanne Nicholl and Paul Allen placing in their respective age groups at Co Antrim’s dairy stock Judging heats. The club wishes them luck as they compete in the Northern Ireland finals. The club held a parents’ night in OC Church Hall on Friday 7th April during which club members took to the stage and entertained family and friends with singing, dancing, junior and senior drama sketches, club scandal and a preview of the one act play. The final club meeting of the winter programme was held on Tuesday 11th April with slippery football, inflatable obstacle course and a barbecue. Members have enjoyed a range of activities for club meetings over the past few months including pantomime, bowling, butchers talk, trip to McElderrys open night for the boys and pamper night for the girls. Senior members travelled to the Armagh City Hotel for this year’s YFCU AGM and conference. The ‘beside the seaside’ themed disco was enjoyed by members with the Randalstown YFC fish taking first place prize for best costume. The Saturday AGM brought further success with club PRO Elizabeth Adair being awarded overall top PRO in Northern Ireland. The club will be hosting their annual sports night this coming Friday (April 28th) starting at 7.30pm in Neilsbrook Community Centre. There will be both girls and boys football and tug of war. For more information see the club’s Facebook page or contact the club secretary on 07938661138.